We now have over 3,300 photos to choose from! All of our photography is available for custom printing on an array of paper and canvas. 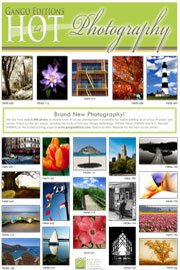 Check out the new pieces, including the works of two new Gango shutterbugs: Christie Hazen (PSHZN) and M.C. Reardon (PSRDN). When using our custom printing page choose ‘photo’ for the category and search by new releases for the most current photos. You can download our New Releases Hot List here . Contact us at 800-852-3662 today for a comprehensive Photo CD with all of our images.